Saltwater fishing boats come in a wide range of shapes, sizes, and designs. If you are new to boating, it can be a tough decision. Are you torn between inshore and offshore activity? Skiffs and bay boats are promising, and some additional tools can create the versatility you need. 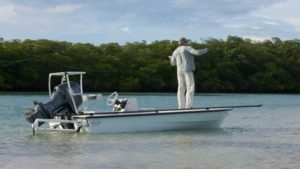 Typically, a 16-foot skiff with a 90 hp motor can navigate the flats with push poles for silent inshore fishing, but speed and rough water are a problem if you move offshore. Bay boats around 18’ to 24’ with a 150-250 hp motor have the speed to cross open bays and tackle the waves near jetties. While they can maneuver in shallow water, the won’t do it quietly and tend to scare the fish away. Anchoring a boat silently works using a Power-Pole. 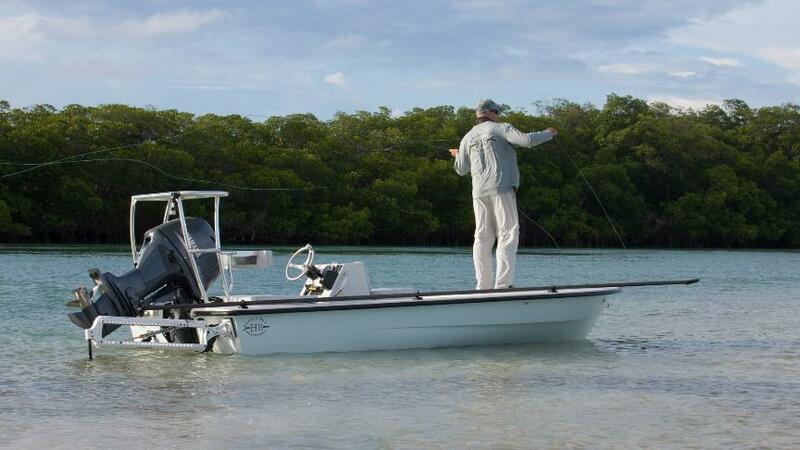 It anchors small skiffs, bay boats, flats boats, and bass boats in shallow water. It’s designed to bolt onto the stern and uses hydraulic pressure to lower a fiberglass stake near the shoreline, as far out as 10’ deep. Some pros use two poles for even more stability. New trolling technology allows a MotorGuide xi5 with an anchor mode to hold the boat in heavy current and in 250 feet of water. Combine that with Power-Poles in the shallows and you can have the best of both worlds. A great example of this is the Yellowfin 24 Bay. It has a stepped hull and Mercury 350 Verado hp engine for speed but is fuel efficient. It handles rough water really well making the conversion from inshore to offshore easily. If you want to catch tuna in the morning and bonefish in the afternoon, try this combination!